This 3-star residence is located in the historic center of Rovinj where are lots of bar and restaurants nearby. The apartment is facing the fishing port and it's near the Hotel Adriatic. Provides all modern amenities such as Wi-Fi, flat-screen satellite TV , and air conditioning. Studio features a fully equipped kitchen , living and dining area , a private bathroom with shower and washing machine , hair dryer, towels and linens. There is double bed and a bedroom with a single bed . You can enjoy the promenade or spend the afternoon sunbathing on the pebble beach which is only 110 meters . The Baroque basilica of St. . Euphemia is only 5 minutes away, and the ferry port is located 250 meters from the residence. Dear guests , Welcome to our apartment ! We try to do everything possible that you can relax as you are at home ! The apartment have a nice and full view on the sea and the island Katarina. It is just 5 minutes from the Baroque St. Euphemia's Basilica away and a few steps from the main attractions . Provides all modern amenities such as Wi-Fi, flat-screen satellite TV , and air conditioning . Studio features a fully equipped kitchen , living and dining area , a private bathroom with shower and washing machine , shower , hair dryer, towels and linens. It is located in a pedestrian area . Our apartment is in the close ( 150 m ) from the green market , post office, market , ambulance , many cafes and restaurants. Wunderschöner Kurzurlaub mit meiner Gattin Ende Oktober. Wir hatten nicht nur Glück mit dem Wetter sondern auch mit dem Apartment. Perfekt für eine Sightseeingtour in Rovinj. Super zentral gelegen direkt am Hafen mit schöner Aussicht auf das Meer. Das Apartment war sehr geräumig und über komplett ausgestattet. Alles war sauber und die Betreuung vor Ort durch Frau Tina war perfekt. Wir kommen gerne wieder. Wir hatten wirklich traumhafte Tage in Rovinj! Tolles, super sauberes, gut ausgestattetes und sehr schön eingerichtetes Apartment in bester Lage. Die Eigentümer waren super nett und hilfsbereit! Der große Balkon bot Platz für unsere beiden MTBs und lud zum gemütlichen Sitzen/Essen mit einzigartigem Blick auf den Yachthafen ein. Durch die zentrale Lage des Apartments fand man sich nach dem Austreten aus der Haustüre sofort im pulsierenden Leben wieder und konnten durch die zauberhafen Gässchen/Geschäfte bummeln... Traumhaft!!! Einzig negativ war der Lärm, der nachts durch den Club unter dem Apartment entstand. Wir sind wirklich nicht empfindlich, doch das war doch sehr sehr laut... vor allem bis mindestens 3-4 Uhr morgens!!! 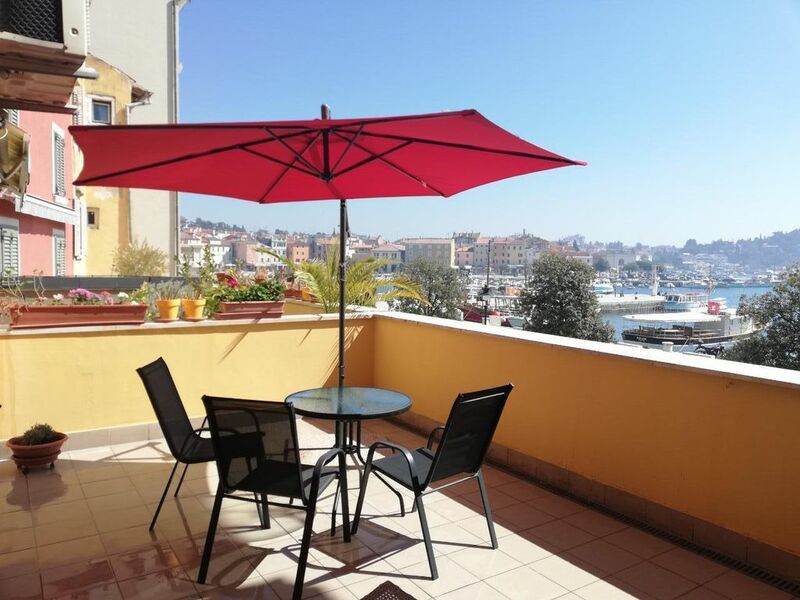 Well-equipped, clean apartment beautifully located right in the centre of Rovinj with a spacious balcony offering a great view on the harbour. Lager: PERFEKT! Wohnung: PERFEKT! Es gibt gar nichts worüber man sich beschweren kann. Es war einfach wunderschön in Rovinj und wir haben die Zeit da richtig genossen. Tina und Ihren Mann waren sehr nett und haben uns sehr gut geholfen mit alles! Rovinj war unerwartet schön! Immer wieder! Auch super war das unsere kleine Hund mitdürfte!!! Kroatien ist sehr hundfreundlich! Rovinj is a small city with historic charm and a long history . The symbols and traces of past times preserve many ancient ruins and home in downtown . The excellent geographical location with a mild climate , diverse and rich content for each guest tailored and long beaches and interesting surroundings contribute to tourist success . Very often in the center are entertainment programs .